Using state-of-the-art, high-power projectors with computer based projection and software technologies, we create spatial projections onto three-dimensional objects. We specialize in precise projections on complex three-dimensional surfaces. First of all, the 3D surface has to be recorded with a scanner and modelled in 3D. Afterwards, we utilize special software to compute the different projector positions, so that they will be able to visualize comprehensive, sharp, congruent projections of images or animation onto this 3D surface. An example of this is the milled head model of the Constantine Colussus: It was masked by several projectors casting dynamic, high resolution image elements onto the face. By using an interactive terminal, visitors could call up different kinds of content: e.g. damage mapping or the reconstruction of the original colouring. In this case, when entering a particular area the room which was monitored by a camera, the eyes of Constantine would move towards the visitors; much to the amusement of our guests. The projection of colour reconstructions is especially suited for archaeological assets (e.g. antique sculptures, gable figures, grave stones, etc. ), whose original colouring is lost today. As an alternative to existing objects, we can also create special 3D models using our milling and 3D printing technologies. These relief models are milled out of plastic based on a prior computer model. Aside from dynamic projections on large-scale maps (e.g. for the migration of cultural groups, find mapping, battle development), we also offer projections onto detailed 3D landscape models. In the example of the Bernstorf castle-hill shown below, we carried out an airborne laser scan to create a highly precise, scaled but slightly superelevated terrain model of the famous Bronze Age hilltop settlement. Different kinds of information could then be projected onto the model via selection on an interactive touchscreen monitor: e.g. topographical maps, historical maps, maps of the castle wall, the excavation areas, special finds or geophysical examinations, etc. 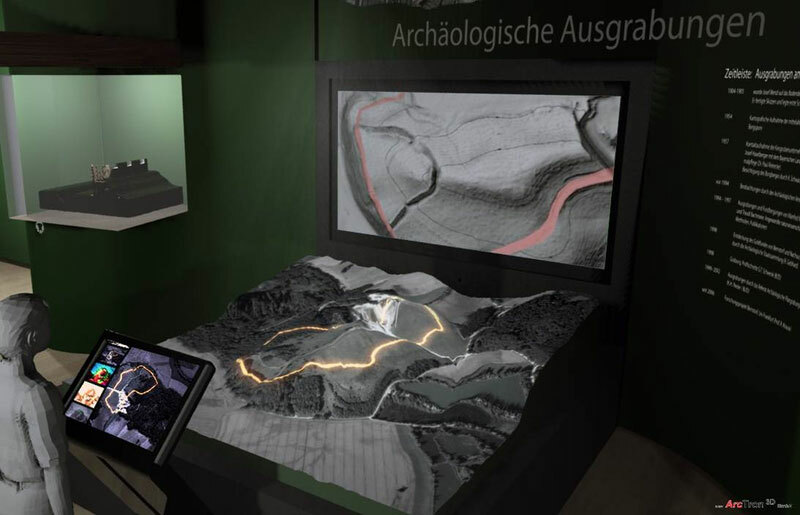 Simultaneously, the background monitor would show reconstructions visualizing the former Bronze Age appearance. This short video shows the mostly implemented planning of a terrain model of the Bronze Age Bernstorf castle-hill. Different, interactively selectable contents are projected onto the milled model. Simultaneously, a big-screen TV in the background shows further information and visualizations on the respective topics. Animation (c) ArcTron 3D GmbH.